Size and strength were considered as desirable factors in the past for dogs to be considered as fearless protectors and efficient hunters. 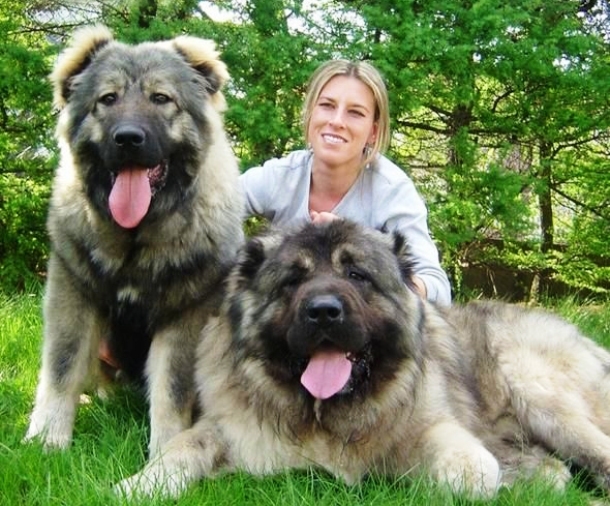 Many giant dog breeds have been created in the centuries. No official classifications such as height or weight are described for a giant dog breed but breeds heavier than 100 pounds (45 kg) can definitely be considered giant. Height and weight of these giants can vary. Some are stout and heavy and some tall and lean. 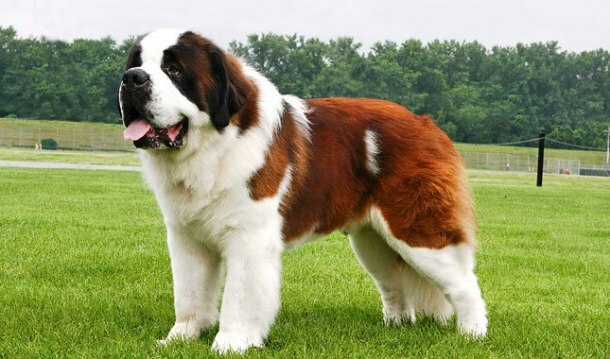 St. Bernard named Benedictine was the heaviest dog weighing 366 pounds (166 kg). Despite the threatening body proportions, most dog breeds are mildly tempered, relaxed and excellent family pets. If you are thinking of owning one such breed, check this list out. Caucasian Shepherds are strongly boned and muscular. 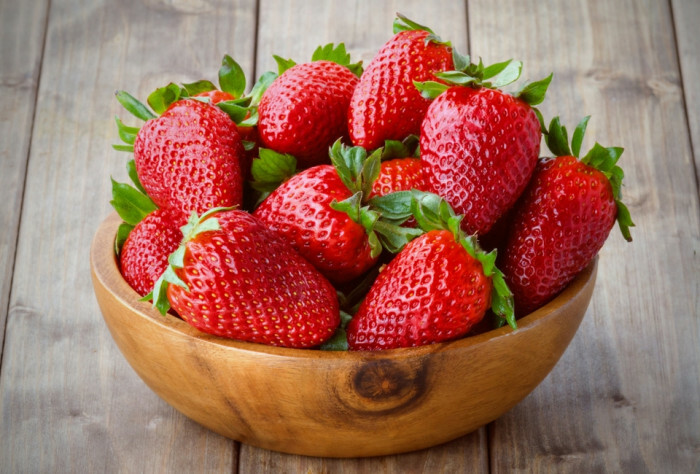 They are also referred to as molossers and are popular in Russia, Armenia, Azerbaijan, North Caucasian area and Georgia. The females measure 28 inches and males measure 30 inches. 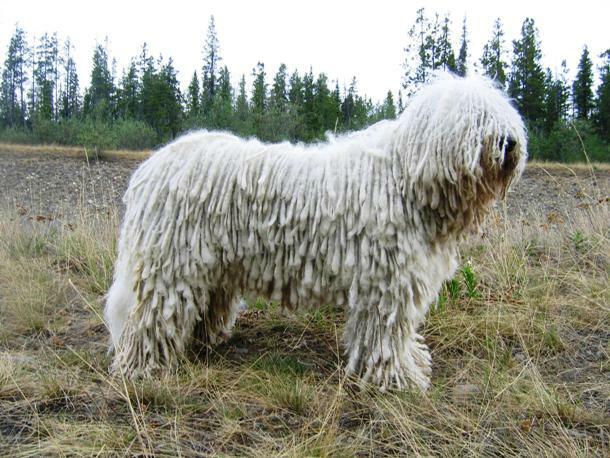 Also referred to as mop dog, Komondor is a powerful long established dog breed that guards livestock and other property. They can be easily recognized with their long and corded coat. Komondor originates from Hungary and is a national treasure of that place. Females weigh 110 pounds (50 kg) and 28 inches in height; males weigh 130 pounds (60 kg) and 31.5 inches in height. Neapolitan mastiff is not as gigantic as the English mastiff but his proportions are too impressive. 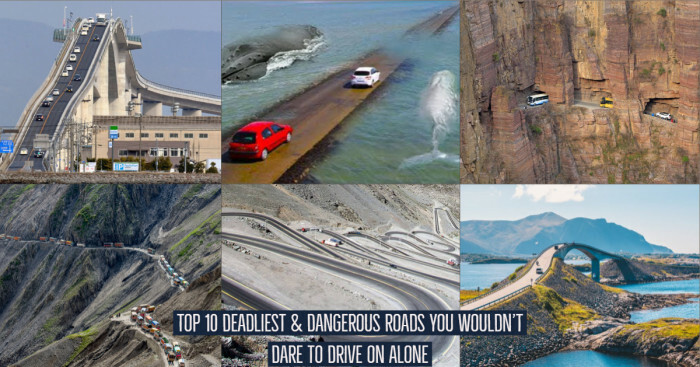 They are fearless and extremely protective for their family and home. Males weigh 130-155 pounds (60-70 kg) and females weigh 110-130 pounds (50-60 kg). This dog breed is extraordinarily intelligent and independent thinkers. St. Bernard is popular in Italian and Swiss Alps. As mentioned earlier, the heaviest ever recorded St. Bernard Benedictine weighed 366 pounds (166 kg). Usually, they weigh 265 pounds (120 kg) and height to 36 inches. Boerboel is a large sturdy, guard dog breed from South Africa. They can be 27 inches tall and weigh 220 pounds (100 kg). They are very obedient and intelligent. They are very loyal to their kids and family and equally protective for their territory as well. 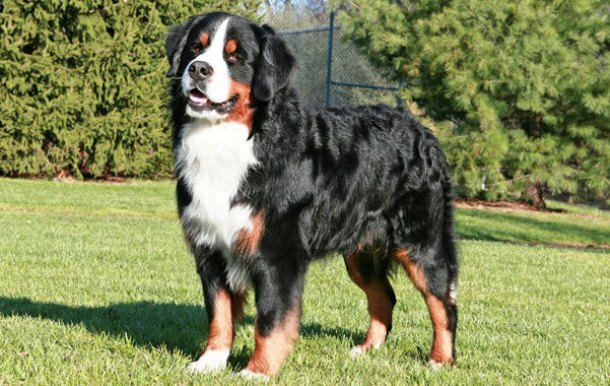 Bernese mountain dogs were originally kept as general farm dogs in Switzerland. This heavy breed is large with tri colored coat. Males are 25-27.5 inches taller and weigh upto 125 pounds (57 kg). Females are slightly smaller than males. The temperaments of this breed may vary but they are generally calm, docile, self-assured and friendly. 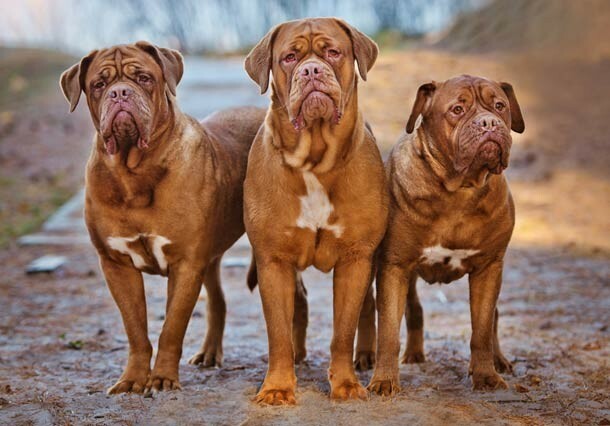 Dogue de Bordeaux is also referred as Bordeaux mastiff or French mastiff. They are one of the most ancient dog breeds of France. They are powerful and muscular and have been employed for works of various capacities like hauling heavy objects and guarding castles. They are not as tall as the others breeds but the males weigh around 150 pounds (68 kg). They probably have the largest head in the canine world but shortest lifespan among all breeds. Unfortunately, this giant breed is prone to various diseases and they live around 5 to 6 years. 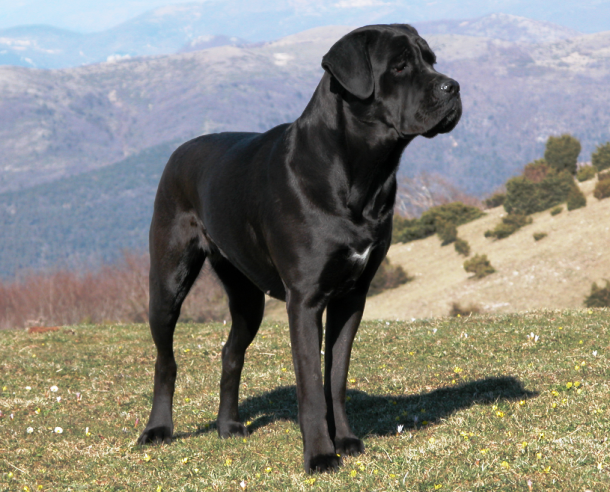 Cane Corso is another Italian breed who is considered as a great hunter and guardian. 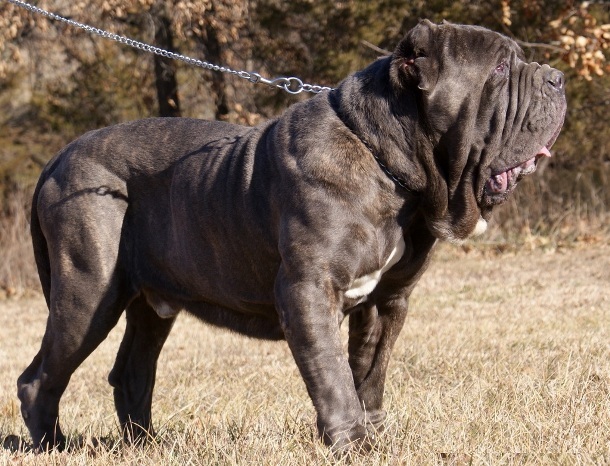 This breed is closely related to the Neapolitan mastiff. 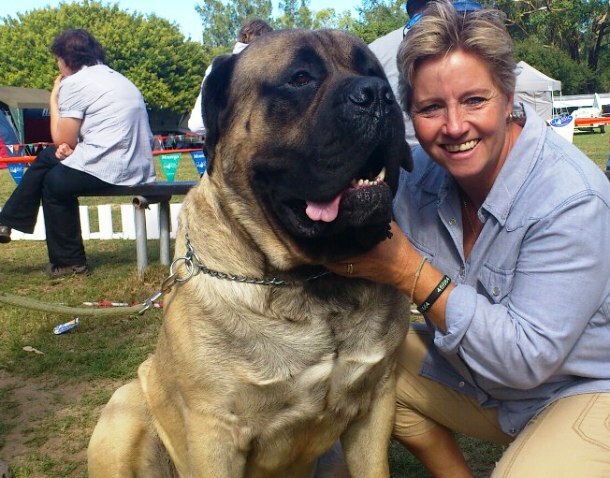 It is well muscled but less bulky than other mastiff breeds. It is 28 inches tall and weighs 88-110 pounds (40-50 kg). Their average life expectancy is 10 to 12 years. 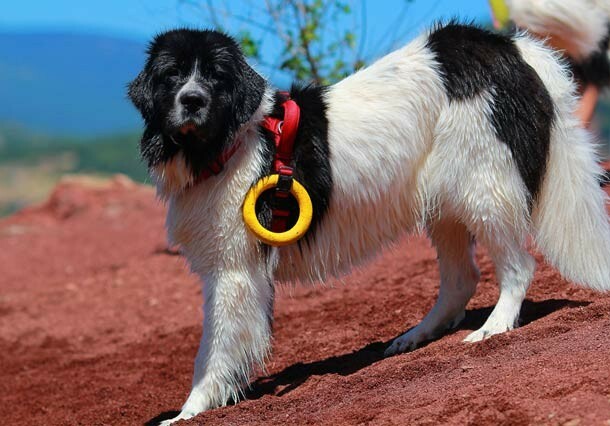 Landseer is very similar to Newfoundlands in appearance and bodily proportions. They are 32 inches tall and weigh 180 pounds (80kg). This dog breed is known for its gentleness, disposition and serenity. They love to swim and are initiators in saving the drowning people. The Landseers are easier to train since they are quicker and more responsive than the Newfoundlands. 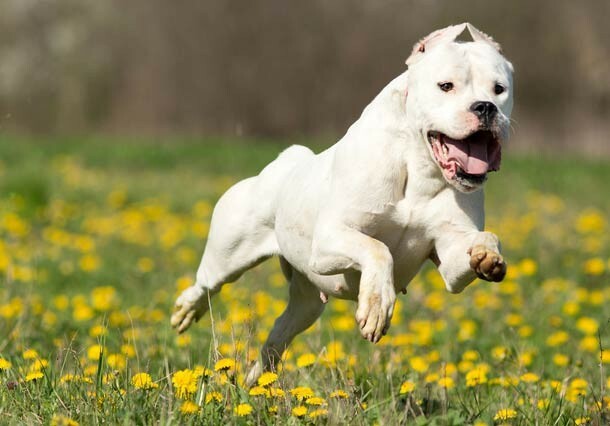 Dogo Argentino was primarily developed in Argentina for the purpose of big-game hunting. It is a huge muscular dog weighing 120 pounds (55 kg) and 30 inches tall. They are covered with short white coats.